A single highway leads to myriad adventures, all within an hour’s drive of Eugene. 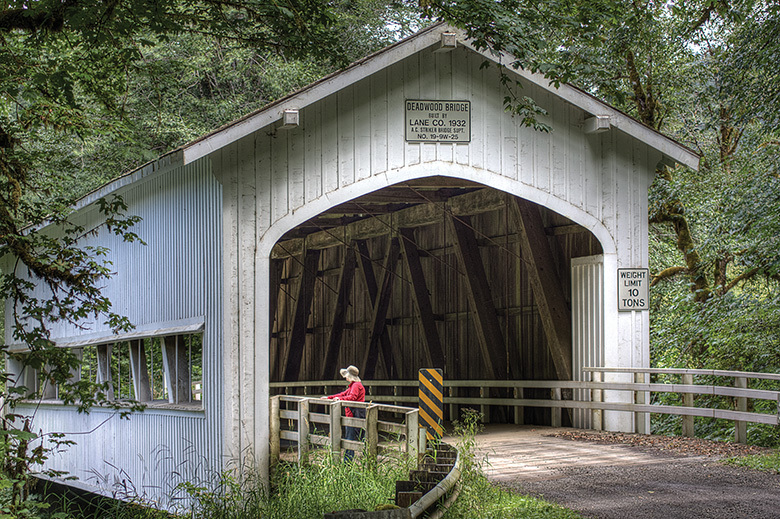 Travel through Lane County's several dozen picturesque covered bridges, including Deadwood Bridge. Check out more gorgeous fall road trips here. My husband and I head east from downtown Eugene’s upscale 5th Street Market, our car stuffed with snacks from its chic food hall, Provisions; caffeine from hip Tailored Coffee Roasters, across the street, coursing through our veins; and our bodies well-rested after a night at the luxe Inn at the 5th next door. We couldn’t be better equipped for a road trip to seek out our favorite Oregon treasures: historic bridges, hidden waterfalls and secret hot springs. But we’re not house hunting, we’re covered-bridge hunting. And all of a sudden, “There it is!” we both exclaim. A tall, snowy-white structure, like a drive-through barn, appears smack in the middle of the road, surprising and delighting us as if it were a long-lost friend. There are about 50 covered bridges in Oregon, more than in any other western state, and most of those are clustered in Lane County. The majority of these bridges were built between 1905 and 1925. Covering a bridge to keep its truss timbers dry was a common practice to extend its life, according to the Covered Bridge Society of Oregon. The Willamette Highway we’ve been cruising is riddled with these bridges, as is the McKenzie River Highway a few miles north (Oregon Route 126) and Row River Road near Cottage Grove a few miles south. You can even cycle past six of them on the 36-mile Covered Bridges Scenic Bikeway. But the best part is that these same roads also lead you to prime hiking spots with spectacular waterfalls, swimming holes and hot springs. All that, and you’re only about an hour from the comforts of Eugene. After marveling at the well-functioning 96-year-old Lost Creek Bridge, we get back on the road, but not for long. A mere six minutes later, we spot Lowell Bridge, the widest covered bridge in Oregon. It’s an interpretive center now, so we walk through to read the signs detailing the history of the bridge and its brethren. We could head north across the river and see two more bridges (Fall Creek and Unity), but decide to stick to the highway and keep going east. Barn-red Office Bridge, the longest covered bridge in Oregon, is the next stop, 20 minutes away. We park and walk through on its pedestrian path, peering down through the cut-outs in the wall at the Middle Fork of the Willamette River. On the other side, we find a day-use spot, complete with restrooms, picnic tables and the entry point for a network of single-track mountain bike trails. That’s when we realize we’re just minutes from the hamlet of Oakridge, considered the mountain biking capital of the Northwest and home to the famed cask ales of Brewers Union Local 180. We resist the urge to hit the pub because we’ve got a different form of relaxation in mind, 20 miles east at McCredie Hot Springs. Once there, we follow the gravel path from the parking area to the bank of Salt Creek, where we find a shallow pool, steaming and sulfurous. It’s only deep enough for our feet and searingly hot, but directly across the water we can see a few bathers lounging chest-deep: Jackpot! I’m too chicken to wade across the swift current, so a friendly local advises us to get back in the car, take the first right, and another after that. “You’ll see a wide spot in the road,” he says. “That’s where the trail starts.” A smattering of parked cars marks the spot, and we take the well-used path through the riparian woods. Ten minutes later and we’re soaking in one of nature’s bathtubs. The two warm pools are a bit silty, but the sight and sound of the icy creek rushing by just a foot away more than makes up for a little dirt. We’re joined by road trippers from the Salem area, and we swap stories of hidden swimming holes and favorite hikes, which is how we hear about Salt Creek Falls, just 20 minutes farther up the highway. The parking fee, wheelchair-accessible paths and picnic tables are our first clues that this must be a popular destination. And then we see why. Just a few yards from the parking lot, you can watch as Salt Creek turns into Oregon’s second-largest waterfall, the water majestically thundering 286 feet down into a fern-covered chasm. Better yet, a five-minute downhill walk along a well-maintained path gets you front and center, with a face full of mist. Photograph by 5th Street Public Market. Luxe overnight lodging at the Inn at the 5th. With late afternoon setting in and our car snacks dwindling, it’s time to head back to Eugene and its culinary (and hops-infused) amenities. We could hit the much-lauded Ninkasi Brewing Company, followed by creative Japanese plates at nearby Izakaya Meiji Company. Or raise a pint at Steelhead Brewing Company and then sit down to upscale seasonal fare at venerable Marché a block away. But our road-trip success has put us in a party mood, so we get margaritas and inventive tacos at colorful Belly Taqueria, then walk up to West Broadway street to check out the nightlife. We stop for a farm-to-cone scoop at Red Wagon Creamery and walk past bars packed with college kids, our sights set on returning to the quiet comfort of the hotel. We’ll need a good night’s sleep—tomorrow, the McKenzie River Highway awaits. Load up these laid-back tunes for a scenic, leisurely drive.